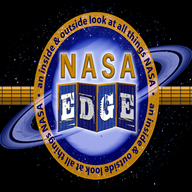 NASA EDGE will be broadcasting live from the NASA Kennedy Space Center Press Site on May 16 from 7:56-9:00 am EDT. See Space Shuttle Endeavour launch off Pad 39A for the last time in this historic flight. The NASA EDGE team will cover aspects of the STS-134 mission, they'll play a special tribute to Shuttle Endeavour, and the crew will be hanging out with the NASA STS-134 Tweeters. It will be a jammed pack show that you won't want to miss.